A lot of the Gung-Ho Guns have fallen victim to defeat, and therefore death, but not by the bullets of the reluctant hero Vash the Stampede. But even if the "Guns" seem to be dwindling, that doesn't mean there's a lack of violent freaks tearing up the planet. In Gunslinger, Vash is running into all sorts of weirdos with guns. 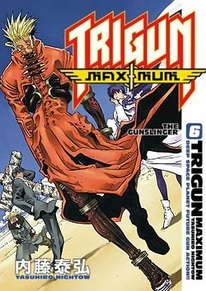 All the while, Knives and his crew have something mysterious going on behind the scenes, and it doesn't look good for Vash and the people he lives to protect.